The first thing you may notice about this chart is that Very Much is a low percentage. I would encourage you to look at the bar for They Don't. Why? Because that bar is by far the lowest percentage of users. 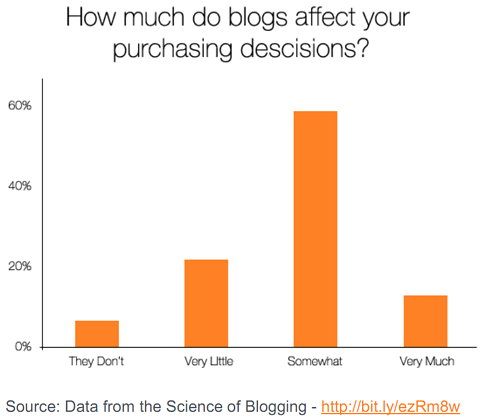 So, if you aren't blogging, congrats, you are reaching a very tiny number of people making decisions about buying your products or services! I know that many small businesses we work with tell us that they never read blogs and can't imagine that any of their customers do either. What we've found is that many small business owners spend as much time on blogs as my kids do on a davenport... but neither know that that's what they're on. 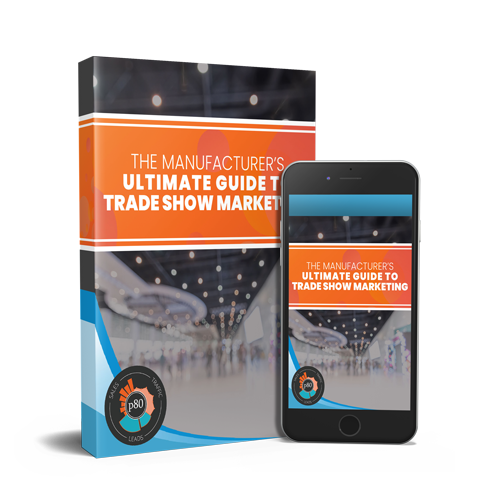 When it really comes down to it, most small businesses read blogs regularly, they just don't realize it. 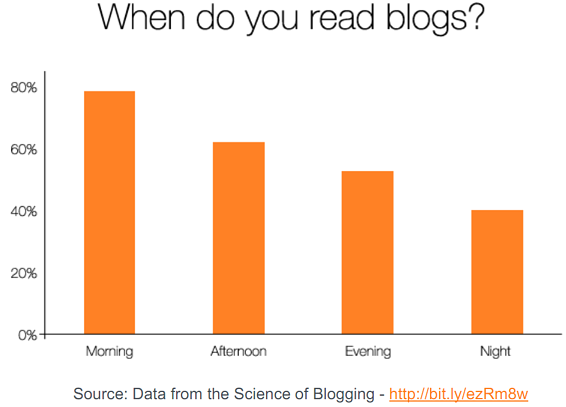 The chart above certainly shows that blog readership is huge. It may not be a dedicated following in most cases, but through searches and shared links, we ALL read a lot of blog content, regardless of the industry. 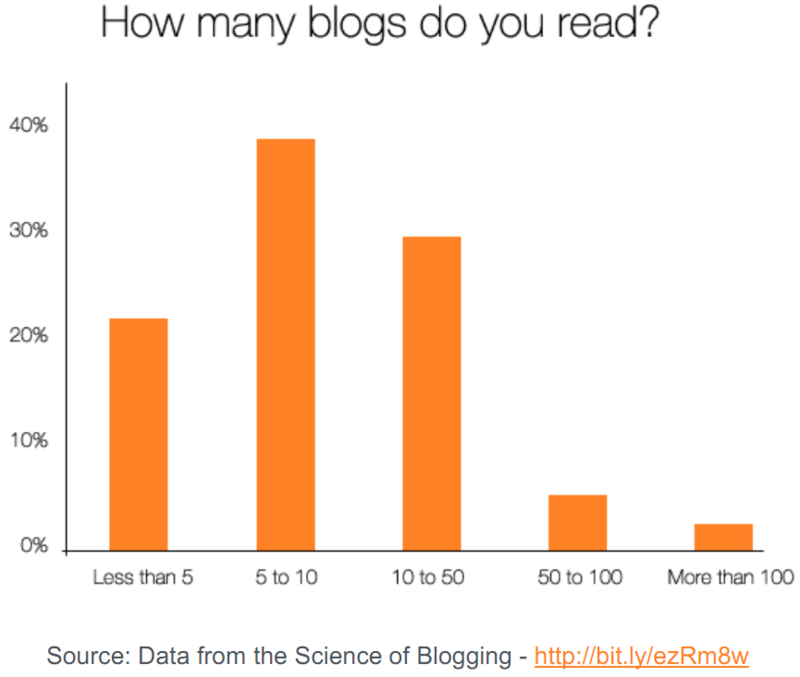 Almost 70% of respondents to this question said that they read 5 or more blogs. Over half of those read closer to 10 blogs. These are just the blogs that they follow and read regularly. 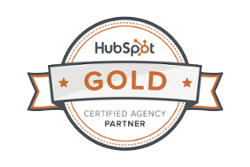 This should show a small business that you don't have to be the 1 or 2 top blogs that readers of your industry read. 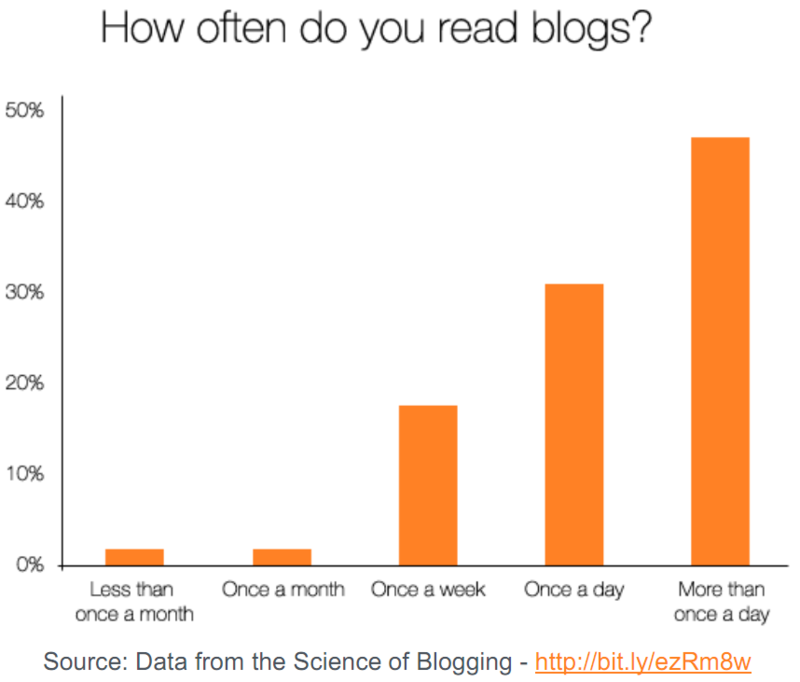 These number show that you capable of being regularly followed with steady consistent blogging. Who's going to follow a blog that posts once a quarter? Blogging gives you a chance at being the first thing many readers think about in the morning and potentially stay with them all day... Clearly it must be noted that respondents were allowed to specify all of the times in a day that they read blogs, thus the percentages add up to much more than 100%. This isn't a catch to this data. I think this is an exclamation point on this data. You have 3 times of day that you will reach over 50% of readers. Top that with a newspaper! For the love of God, please start blogging if you're not or pick up the pace on content generation if you already are. Need some help staying on track? Check out my post from last week on keeping on track. Small Businesses can compete against the biggest companies in the world with a solid content strategy. We would love to help you get there.